I was really let down by this teatox, so I gave it 1 out of 5 stars. It has a strong laxative in it that I’ve never heard of called Celandine. Well this ingredient and my stomach definitely don’t agree. 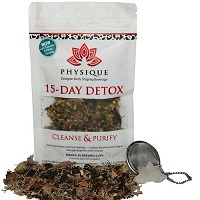 I was sick the entire time I used Physique 15 Day Teatox. I had stomach cramps, digestive issues, and my whole body felt weak from how often I was using the restroom. So be very careful while using this tea, it’s one of the stronger ones out there. Now, it doesn’t taste good either. It tastes so bitter and strong. It’s really hard to drink two cups per day because I despise the taste. The other weird thing is, I ran out of tea after a few days, so it definitely doesn’t last 15 days. The price isn’t bad, and I’m happy they have a money back guarantee, but overall I don’t like this tea. 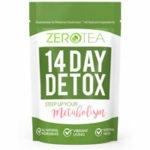 This is a 15 day detox tea that you drink twice daily. Overall, it’s pretty easy to use. It’s a loose-leaf tea, and it comes with an infuser which is great. You’re instructed to use this tea twice daily, once in the morning upon rising or before a workout, and the other in the afternoon. The directions say to only fill up one side of the infuser with tea, don’t overfill it. Then you leave the tea in the infuser for your second cup of the day. So you only need to fill it once per day, and are essentially reusing the tea for 2 glasses. The odd thing is that I followed the instructions and didn’t fill up the infuser, but I still ran out of tea at about day 8. So this really isn’t a 15 day teatox, but more of a week detox. The taste of this tea is awful. There’s just no nice way to put it. It’s so bitter I could hardly choke it down. No amount of honey or lemon helped it. I don’t see many people enjoying the taste of this detox tea. This tea contains a surprisingly harsh laxative ingredient that I’ve never seen before. It’s called Celandine. After researching it, I found that Celandine was used in the olden days to “purge” your body of parasites and other diseases. So, it has a very strong laxative effect that I’m not a fan of. It also contains Burdock, which is a mild laxative, but a laxative nonetheless. Another ingredient it has is Lobular Kuding Leaf. After googling this ingredient, I really couldn’t find much information on it, just that it’s a leaf from China. It always scares me when there’s not a lot of information on an ingredient. 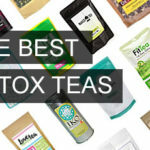 Overall, I really just don’t like that this detox tea contains 2 laxatives. I could only use this tea for a few days because of the bad side effects I was having from it. So needless to say, I didn’t see any positive results. I guess you could say I lost a few pounds from using the bathroom so often, but that’s not healthy at all. I felt so sick and so weak while using this tea. Whenever I’d drink it, I’d find myself running to the bathroom multiple times a day with major stomach cramps. It was so awful. Losing weight that way isn’t healthy at all, and can actually have bad effects on your body. I didn’t feel detoxed or less bloated, I just felt sick. Like I mentioned above, I had extreme stomach cramps, diarrhea, and weakness. I was also tired while using this tea, probably because it was depleting my body of all nutrients. 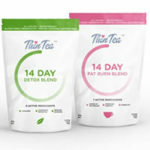 Physique 15 Day Teatox is $15 for a 15 day supply. That’s $1.00 a day, which isn’t bad, but I wouldn’t pay it again for this tea. Yes, they have a money back guarantee, which is one thing I like about this product. If you don’t like it or have bad results, you can send it back for a refund. To buy Physique 15 Day Teatox, Click Here. Ease of Use Use twice per day, but I ran out of tea after a few days. Taste Tastes horrible, so strong and bitter. Price/Value It’s $1.00 which is a good price point.